Message 5756 - Posted: 20 Jul 2014, 13:39:24 UTC - in response to Message 5754. Each work unit will run until at least 1 Decoy has been run. If it takes longer than your set preferences then it keeps going till at least 1 Decoy finishes. Setting to 2 hours will work most of the time. The 5-6 hour run times happen to suit my 6 hour preference setting, but even then I have had some go over 7 hours. I have not tested the check-pointing so I can't test if the work units restart from zero like you are seeing. restarted project, out of the 7 tasks only 1 restarted from 25% completion, the rest of 6 tasks restarted from 0. in effect lost 6 x 1 hours work. e.g. if there are no structures and the session is interrupted that'd effectively means if the task/job is restarted it'd start from zero all over? the other thing would be if some jobs hits a 'dead end' (runs for hours without finding solutions, perhaps goes into endless chaotic loops), there'd hence be no structures & no credits would be awarded/claimed? another way i'd guess is the necessity to award credits/allow claimed credits to the 'no solution' (no models) runs where after the 'reasonable' timeframe no solutions are found. i guess the max default run time is 6 hours, hence, app developer should consider terminating with credits for such cases. however, for many participants with a fairly recent cpu that runs somewhat 'fast', after 3-4 hours where there are no solution, the participant may not want to continue the run. hence, participants need to have a 'computing preference' to state that the max default run time preferred is hence say 4 hours. Message 5759 - Posted: 20 Jul 2014, 21:31:25 UTC - in response to Message 5758. Is anyone from the project actually around to monitor any responses. Or is Mr.Baker & Cie only available when there's a chance to bask in the limelight? Message 5760 - Posted: 21 Jul 2014, 6:54:34 UTC - in response to Message 5759. You're too mocking....but you've some reasons. There is a big "lack of comunications" with r@h team. Message 5762 - Posted: 22 Jul 2014, 1:33:10 UTC - in response to Message 5761.
hope admins consider that and enhance the server codes. Message 5763 - Posted: 22 Jul 2014, 8:52:51 UTC - in response to Message 5762. This request is repeated frequently on Rosetta forum. Other volunteers have suggested that it is a problem of customization of actual server. But admins have not said anything. Message 5764 - Posted: 22 Jul 2014, 15:57:54 UTC - in response to Message 5763.
strictly speaking i'm speculating a possible factor for the low credits is mainly an *instance* caused (most likely) by faulty boinc-client s/w. as statistics is 'lost' on a shutdown/restart, it 'mis-reports' credits to the server. as the claimed credits is much lower after the restart it affects the average credits that's awarded to the task and any later participants. while i normally ignore them (as like u credits aren't really the purpose to crunch rosetta), it may make some participants unhappy about the low granted credits esp for those who pick up the subsequent same jobs. the solution of course is to fix my (an instance of) faulty boinc client, but i'm just putting in my 2 cents reasoning on the 'collerateral damage' that others may observe. my guess is that this issue may be partially alleviated from the server if the server ignores exceptionally low credits when computing the granted credits. It is NOT "faulty boinc-client s/w." OR " statistics is 'lost' on a shutdown/restart"
It is faulty rosetta software (or particular WUs batch) - it simply not write checkpoints at all (i already check this - intermediate checkpoints in last Wus batches not working, seems only full/finished models saved to disk). So at each restart ALL work already done before restart went to trash can. And start work from scratch after restart. Also some of WUs run so long (possible algorithm looped infinitely or just very difficult model to calculate) so even after 5-7 hours of running(without interruptions / restarts) on modern CPU can not finish very first model (decoy). average claimed credit per 1 decoy (collected and calculated from prev users who report WUs from same batch) multiply by number of decoys reported in particular task of a specific user. So if decoy count = 0, granted credits = 0 too. But later programmers added exception: if user report task with decoy count = 0 not use general formula (which gives 0 Cr) but reward WU with fixed 20 Cr as some sort of consolation/booby prize. Message 5766 - Posted: 22 Jul 2014, 21:59:23 UTC - in response to Message 5756. To roughly check works of checkpoints not necessarily to restart. You can click "properties" of any of the currently executing task and check the line "CPU time at last checkpoint". If checkpoints saving are working normal there will be the time(counted from start of task) of last checkpoint saved. If checkpoint does not work there will be "-- --" on this line. Or time few hours ago/less compared to total CPU time - if the client could finish at least one model completely and recorded it on a disk - it also counted as checkpoint and usual this part work normal. Message 5767 - Posted: 23 Jul 2014, 6:40:03 UTC - in response to Message 5765.
what is meant in the news post to this thread by "If you have an android arm device/phone that supports android-9, ..."? What should "android-9" be? 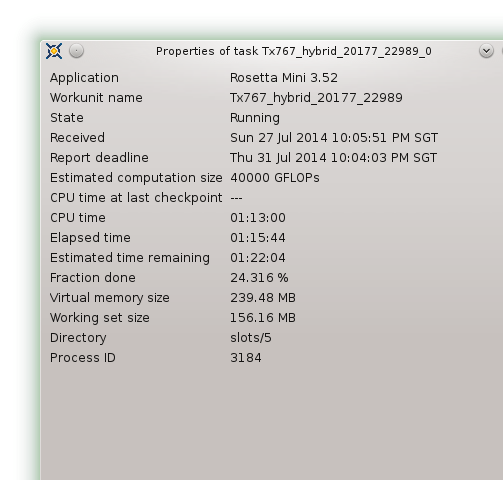 I tried to start a workunit on Android 4.4.4 with the NativeBoinc client but it didn't work - additonally I got the message "Rosetta Mini is not availiable for your type of computer. Message 5769 - Posted: 25 Jul 2014, 2:41:26 UTC - in response to Message 5766. The problem with the current checkpoint setting in the WUs is that the recent batch of WUs seem to reset itself a lot, always starting from scratch instead of being able to continue from the last checkpoint. That's the purpose of checkpoints. Message 5770 - Posted: 25 Jul 2014, 6:26:36 UTC - in response to Message 5768. The first version running on android is 3.53. Now there is a batch of 3.52 so it is normal this message. Message 5771 - Posted: 25 Jul 2014, 6:27:04 UTC - in response to Message 5769. Message 5772 - Posted: 27 Jul 2014, 15:25:56 UTC - in response to Message 5765. There is no checkpoint ! all 6 concurrent ralph@home tasks did not checkpoint after running for more than an hour. note that all these ralph@home and rosetta@home sessions are running concurrently in the same boinc-client (7.0.36) ! some error in the job run parameters or that it's necessary to improve minirosetta to make such complex jobs/tasks checkpoint?